If you live in a rural area or have vacation property in the middle of nowhere, you’re no doubt familiar with the form and function of a septic system. In brief, a septic system is your very own onsite sewage treatment facility. It’s used primarily where access to a municipal sewer system is neither available nor economically practical. 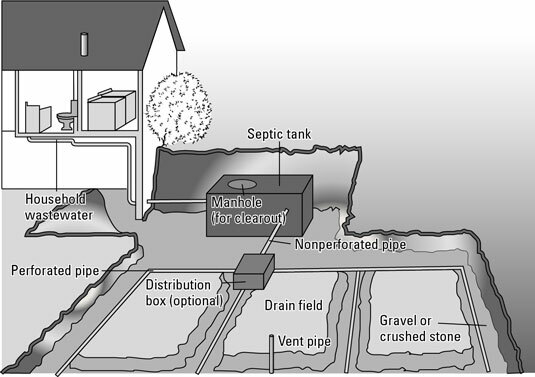 A septic system is out of sight and is odorless (when properly maintained). A septic system is reasonably maintenance-free. A well-constructed, properly maintained tank could last indefinitely. However, the leach field (the underground area where all of the sewage drainpipes are located) will most likely require some treatment or perhaps replacement after about 15 to 20 years of service. Following a few simple rules — like not using too much water and not depositing materials in the septic tank that bacteria can’t decompose — should help to make a septic system trouble-free for many years. According to proper septic tank maintenance, the tank does need to be cleaned out when too many solids build up. Inspect your system and keep accurate records. Regularly inspect your system for proper upkeep and organize your system’s records (diagram, system maintenance, etc.). Pump out your septic tank regularly. The standard rule is to pump your septic tank every one to three years to ensure that solids are properly broken down and will not clog the drain field. Routine pumping can help prevent system failure and increase the longevity of your system. Conserve water and monitor usage. Moreover, discharging more water into the system than it can handle can cause it to back up — not a desirable occurrence. Don’t use excessive amounts of any household chemicals. You can use normal amounts of household detergents, bleaches, drain cleaners, and other household chemicals without stopping the bacterial action in the septic tank. But, for example, don’t dump cleaning water for latex paintbrushes and cans into the house sewer. Don’t deposit coffee grounds, cooking fats, wet-strength towels (paper towels that don’t dissolve easily, like the heavy-duty kind), disposable diapers, facial tissues, cigarette butts, and other non-decomposable materials into the house sewer. These materials won’t decompose, will fill the septic tank and will plug the system. Use a high-quality toilet tissue that breaks up easily when wet. One way to find out if your toilet paper fits this description is to put a handful of toilet tissue in a fruit jar half-full of water. Shake the jar, and if the tissue breaks up easily, the product is suitable for the septic tank. Avoid dumping grease down the drain. It may plug sewer pipes or build up in the septic tank and plug the inlet. Keep a separate container for waste grease and throw it out with the garbage. According to the Environmental Protection Agency, because of the presence of significant numbers and types of bacteria, enzymes, yeasts, and other fungi and microorganisms in typical residential and commercial wastewaters, the use of septic-system additives containing these or any other ingredients is not recommended. Again,it’s important that you have your septic tank pumped and cleaned by a professional every one to three years. A septic tank in a northern climate will need to have the solids removed more often than a tank farther south. (This geographic variance is primarily because cooler temperatures inhibit bacterial action and provide less decomposition of the sewage solids.) How often you need to have your septic tank pumped also depends on the size of the tank, the volume of wastewater, and how many solids go into it. Constant foul odor, slow drains, and drains that back up are all telltale signs that your septic tank needs pumping. When in doubt, call in a septic pro.